SEOUL, South Korea, Nov. 9, 2018 /PRNewswire/ -- To commemorate the 1st Hyundai Global Customer Experience Championship held from November 5 to 8, Shell being the exclusive sponsor to the event, hosted a "Shell Gala Dinner" at the Seoul Dragon City Hotel on November 7. Winners of Shell Awards pose for a commemorative photograph at “Shell Gala Dinner” celebrating the 1st Hyundai Global Customer Experience Championship held at the Seoul Dragon City Hotel. The 1st Hyundai Global Customer Experience Championship is a global event for Hyundai Motor Company (Hyundai) to congratulate and encourage the results and efforts of global employees of Hyundai and to share best practices from each nation. Attending this event were approximately 190 sales and service representatives who have superior results among the 60 nations where Hyundai has a presence. They participated in friendly contests on sales and services for over a total of 3 rounds. Shell is sponsoring this event as Hyundai Motor Company's global business partner. 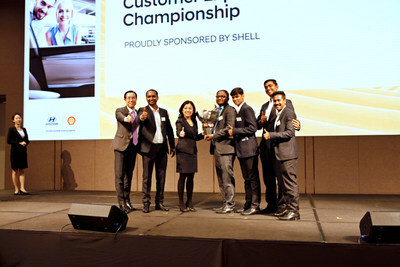 Shell continued the festive atmosphere through the Shell Gala Dinner provided to congratulate the holding of the 1st Hyundai Global Customer Experience Championship. Ms. Lee Ming Seow, the Asian OEM General Manager of Global Key Accounts in Shell and Mr. Woongsik (Wayne) Oh, Director of Customer Experience Management Group launched the event by giving congratulatory remarks while each region's sales and service representatives were given the Shell Awards and a lucky draw conducted as well. Ms. Seow from Shell Global Key Accounts said in her welcoming remarks that "Shell, through global collaboration with Hyundai Motor Company has topped the global list of lubricants supplier over the past 12 years. We host this gala dinner to congratulate Hyundai on holding the 1st Hyundai Global Customer Experience Championship as Hyundai's global business partner." In addition, she also mentioned: "Owing to the efforts of the employees of Shell and Hyundai we garnered outstanding performance amid the uncertain market situation. We aim to step up our collaboration Hyundai through other ventures such as Future Mobility and New Energy Solutions "
Mr. Oh from Hyundai Motor Company said: "All the sales consultants and service advisors did a great job in the competition. Also, Hyundai has been endorsing Shell for the last 14 consecutive years. I would like to thank the consistent support and hope that this friendly relationship between Shell and Hyundai will continue under the global partnership." Shell held the Shell Awards to encourage the efforts of the sales and service representatives and to enhance their collaboration. The Best Business Growth Award went to Hyundai Motor India Ltd, The Best Business Collaboration Award went to Beijing Hyundai Motor Company, and the Best Marketing Collaboration Award went to Hyundai Motor Thailand Co., Ltd. Shell signed a Global Business Cooperation Agreement (GBCA) with Hyundai in 2005 and has been continuing a wide variety of global collaborations for 14 years including being the exclusively recommended lubricants supplier to Hyundai's aftermarket globally and becoming a strategic technical partner and co-sponsoring the Hyundai's World Rally Team since 2014. The companies in which Royal Dutch Shell plc directly and indirectly owns investments are separate legal entities. In this press release "Shell", "Shell group" and "Royal Dutch Shell" are sometimes used for convenience where references are made to Royal Dutch Shell plc and its subsidiaries in general. Likewise, the words "we", "us" and "our" are also used to refer to Royal Dutch Shell plc and subsidiaries in general or to those who work for them. These terms are also used where no useful purpose is served by identifying the particular entity or entities. ''Subsidiaries'', "Shell subsidiaries" and "Shell companies" as used in this press release refer to entities over which Royal Dutch Shell plc either directly or indirectly has control. Entities and unincorporated arrangements over which Shell has joint control are generally referred to as "joint ventures" and "joint operations", respectively. Entities over which Shell has significant influence but neither control nor joint control are referred to as "associates". The term "Shell interest" is used for convenience to indicate the direct and/or indirect ownership interest held by Shell in an entity or unincorporated joint arrangement, after exclusion of all third-party interest. This press release contains forward-looking statements (within the meaning of the U.S. Private Securities Litigation Reform Act of 1995) concerning the financial condition, results of operations and businesses of Royal Dutch Shell. All statements other than statements of historical fact are, or may be deemed to be, forward-looking statements. Forward-looking statements are statements of future expectations that are based on management's current expectations and assumptions and involve known and unknown risks and uncertainties that could cause actual results, performance or events to differ materially from those expressed or implied in these statements. Forward-looking statements include, among other things, statements concerning the potential exposure of Royal Dutch Shell to market risks and statements expressing management's expectations, beliefs, estimates, forecasts, projections and assumptions. These forward-looking statements are identified by their use of terms and phrases such as "aim", "ambition', ''anticipate'', ''believe'', ''could'', ''estimate'', ''expect'', ''goals'', ''intend'', ''may'', ''objectives'', ''outlook'', ''plan'', ''probably'', ''project'', ''risks'', "schedule", ''seek'', ''should'', ''target'', ''will'' and similar terms and phrases. There are a number of factors that could affect the future operations of Royal Dutch Shell and could cause those results to differ materially from those expressed in the forward-looking statements included in this press release, including (without limitation): (a) price fluctuations in crude oil and natural gas; (b) changes in demand for Shell's products; (c) currency fluctuations; (d) drilling and production results; (e) reserves estimates; (f) loss of market share and industry competition; (g) environmental and physical risks; (h) risks associated with the identification of suitable potential acquisition properties and targets, and successful negotiation and completion of such transactions; (i) the risk of doing business in developing countries and countries subject to international sanctions; (j) legislative, fiscal and regulatory developments including regulatory measures addressing climate change; (k) economic and financial market conditions in various countries and regions; (l) political risks, including the risks of expropriation and renegotiation of the terms of contracts with governmental entities, delays or advancements in the approval of projects and delays in the reimbursement for shared costs; and (m) changes in trading conditions. No assurance is provided that future dividend payments will match or exceed previous dividend payments. All forward-looking statements contained in this press release are expressly qualified in their entirety by the cautionary statements contained or referred to in this section. Readers should not place undue reliance on forward-looking statements. Additional risk factors that may affect future results are contained in Royal Dutch Shell's 20-F for the year ended December 31, 2017 (available at www.shell.com/investor and www.sec.gov). These risk factors also expressly qualify all forward looking statements contained in this press release and should be considered by the reader. Each forward-looking statement speaks only as of the date of this press release, [insert date]. Neither Royal Dutch Shell plc nor any of its subsidiaries undertake any obligation to publicly update or revise any forward-looking statement as a result of new information, future events or other information. In light of these risks, results could differ materially from those stated, implied or inferred from the forward-looking statements contained in this press release.